Last week I traveled up to Ottawa with two of my students – our goal was to visit the Arachnid collection at the Canadian National Collection of Insects (CNCI) (and Arachnids and Nematodes). The spider collection is housed on the fourth floor of the Neatby building, in a room that seldom has its lights turned on. 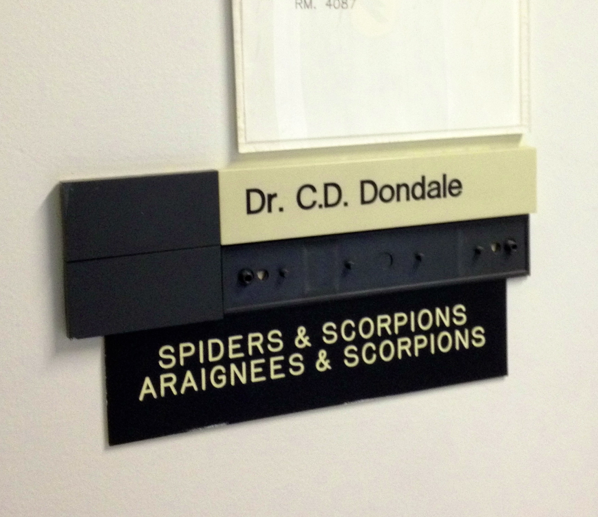 Canada’s National Spider collection has been without a curator since the 1990s, when Dr. Charles Dondale retired. In fact, his name is still on the door. The spider collection has historically been one of the finest, world-wide. 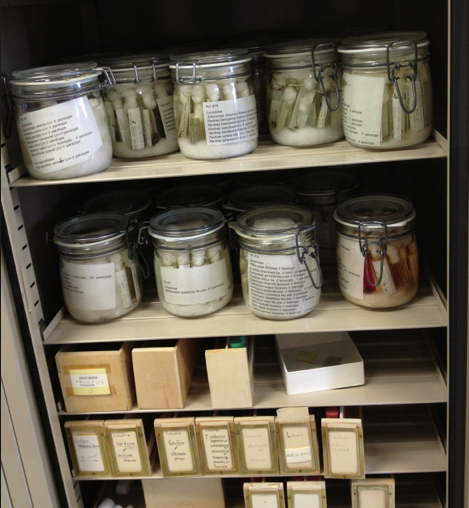 It contains numerous type specimens, and houses thousands upon thousands of vials, all within stand-up cabinets. 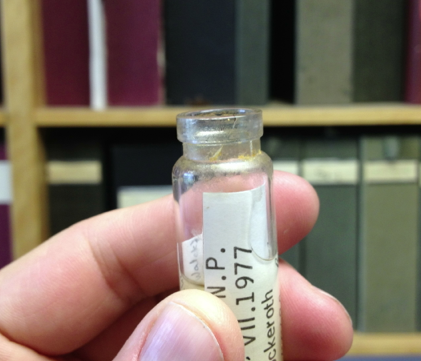 These vials contain rich biological information – they contain a spider with a species name, where it was found, who collected it, and when. These kinds of museum data are absolutely vital as we try to understand our biodiversity, and how it might be changing in the face of environmental stresses. Museum data form the basis of taxonomic revisions, and museum specimens (identified to species, by experts) are an important way for someone to learn taxonomy (that is how I did it!). Our goal in the spider collection was to data-base some specimens – this means taking what is written on (old) labels, and entering data into a data-base (one that will eventually go on-line). On this trip, we were looking for some records of purse-web spiders in North America, and for northern black widow spider records. We also worked to database the jumping spiders (Salticidae), with a particular focus on those species occurring in Canada. 1. Label data are useful data! I have quite a few projects ongoing this summer, including a better understanding of the distribution of jumping spiders in Quebec. There’s no better way to find certain species than going to where they have been found before. How do you know where they have been found before? Although much can be gleaned from publications, there are hundreds of specimens that have been collected and stored at the CNCI, but whose data has never been used in a publication. Looking at vials and reading labels is a good place to start, and while doing this, it only makes sense to enter the information into a data-base. It’s not exciting work, but having data digitally accessible allows my own research interests to move forward more effectively. 2. I’m an Arachnologist in Canada, and as such, I feel a responsibility to use the collection in Ottawa. The spider room at the CNCI is where (historically) Canada become a global leader in spider taxonomy. Charlie Dondale and others (notably James Redner) wrote some of the most important papers and books about spiders in North America, and their (free!) books remain a critical resource for Arachnologists throughout North America. The hallowed grounds of the spider room are where much of this work occurred. It’s a special place, and one that is worth visiting. 3. If you don’t use it, you’ll lose it. The future is not bright for this spider collection. Surprisingly, a replacement for Charlie has not be hired. We need an Arachnologist in Ottawa (I’ve written about this before). I worry deeply for this collection, and even a few visits per year are better than none at all – it shows there is still broader interest in the spider collection, and that it remains an important resource for people from other regions of Canada. Showing continual use and interest in the collection is a great way to show its value. 4. If it’s lost, let’s hope the data are not. Time for thinking about ‘worst case scenarios‘: every time I am at the CNCI I see evidence of further degradation of the spider collection. Spiders are stored in ethanol, long-term, and without curation the ethanol degrades, discolours, the specimens get brittle or break apart, the labels fade or become unreadable, or perhaps a vial or two break. The spider collection has not receive high consistent curation for a very long time. At the very least, we better have the data from those specimens, and that requires data-basing. Trouble in the collection: A vial with a cracked glass lip. In sum, the spider room at the CNCI is a national treasure and it was really great to be there. 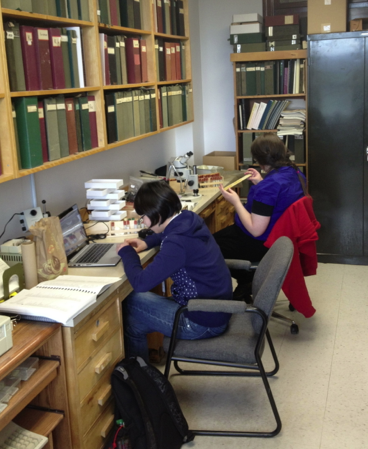 We didn’t get much done (only about a hundred specimens databased – and, truthfully, I did very little of the hard work – my students did all the heavy lifting). But it was a start, and means that we’ll need to come back. I sincerely look forward to the next visit! Thank you and your students for making this effort. I wonder if you could more quickly ensure that the information survives by taking the labels out and photographing them as a group, one vial per image. You could drop a small slip in the vial to indicate that it has been photographed and keep it from being photographed again (or less reliably, attached a colored dot sticker). You’d probably work through a lot more specimens that way. You can then enter data into the database at your leisure, or at least create a spreadsheet that could be imported. You could also leverage the help of more students by not requiring that they make the trip. Joe – thanks for the comment – it’s a good idea – I think our next trip (to be done with a team of people), will really give us a sense of the task ahead. We may need to resort to what you propose, so at least data will be saved digitally even if not all the pieces of it are individually databased. Is there possibly any funding for undergrads to do some light curating as a part time gig?